It's a common problem we dog-treating veterinarians encounter almost every single day. It happens when the owners of overweight dogs, typically in an effort to reduce their dog's dietary intake, meet an obstacle they mistakenly refer to as "hunger." Hunger­: As in, "I tried to cut down her food to two scoops instead of three, and she was so hungry she followed me around all day with that hang-dog look on her face." See Also: Why Does My Dog... Always Seem Hungry? But here's the thing: "Hunger" in this context seldom approximates the veterinary definition. When veterinarians refer to hunger, we tend to mean what happens when an organism doesn't receive the nutrients it needs to achieve its biological goals. Yet what dog owners mean by hunger has more to do with how their pets act when they're deprived of a satisfying resource they're accustomed to receiving. In other words, most owned and loved dogs, like most Americans, are seldom truly hungry in the clinical sense of the word. In our culture's common tongue, it's employed more as a general term relating to the behaviors our pets display when they want food. In case it's not already obvious, what I'm offering here isn't a novel concept. Everyone from Oprah and Dr. Oz to your own physician has told you so: Wanting to eat doesn't necessarily mean you're hungry. Living in a land of plenty, we modern humans have a way of getting these things confused. Which is presumably why we tend to suffer obesity at such alarming rates. So why should it be any different when it comes to our dogs? It's not. At a recent conference I attended on the subject of pet nutrition, childhood obesity expert and professor of pediatrics at Baylor College of Medicine Dr. Theresa Nicklas, described how different parenting styles correlated with obesity in children. Which came as no surprise to the practicing veterinarians in the room. 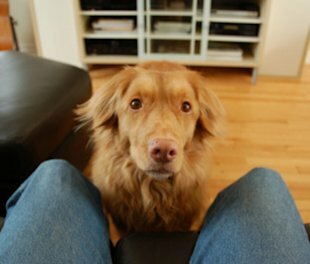 We're are all too familiar with the indulgent "parenting" style of the owner who laces the food bowl with cream and distributes treats every time the dog looks her way. We're also no stranger to a "neglectful" style of the owner who fills a bowl of kibble into bottomless perpetuity and pays no attention to the amount of food the pet consumes daily. Though vastly different in intent, both styles have one thing in common (apart from tending to induce obesity): Neither takes into account an animal's true nutritional needs. Both are all about satisfying the pet's desire to eat and hoping that'll be good enough. Though the neglectful style is definitely a factor in my practice, the indulgent style is far more prevalent among my clientele. These are the people who have the "hungry" thing all wrong. It should be obvious they're "killing their pet with kindness" with their "food is love" mentality, yet from a veterinarian's perspective, it can be difficult to demonstrate these concepts to a pet owner in the context of a veterinary exam room. After all, informing doting pet owners that they're indulgent parents who woefully misinterpret their pet's behavioral cues as nutritional imperatives might make them sit up, but it won't make them want to hear any more of what you've got to say. I got to thinking about this recently after the fifth fat dog of the morning arrived with yet another "hungry hang-dog" story as to why he clocked in heavier than the year before (despite having had this very same conversation 12 months prior). Could it be as simple as telling pet owners what "hungry" isn't? 1. His bowl is full, but he doesn't touch it. He'd rather sit and salivate as you massage meatloaf fixings. You assume he's hungry and so you feed him the detritus of your kitchen work. Later that night he cleans his bowl too. This dog is smart (and fat). 2. Her bowl is full, but she doesn't touch it until you add tasty things to it (ground beef, chicken, cottage cheese, yogurt, etc.). In fact, you're convinced she'd never have her "hunger" satisfied unless you doctored up her food. And that would be OK if a) you maintained a sound nutritional balance in your add-in choices and b) you didn't feed too many calories, but both are rarely the case. In fact, many owners will find that their dogs will increasingly turn their noses up at food that isn't primarily comprised of add-ins. Which is how "she'll only eat chicken" happens. 3. His bowl is full (sense a pattern here? ), but he won't eat unless you happen to come across a food he thinks is good enough. This could take many tries and maybe more than a day or two, all of which convinces you he's starving. But the truth is that dogs' metabolisms are such that they can easily go for many days without experiencing true starvation. In fact, most dogs whose owners say they have to work hard to keep their pets eating on a daily basis are overweight. I suspect this is because these dogs are not naturally inclined to eat what their owners deem to be an "acceptable" amount of food. And some may not even be interested in eating every single day. It's clear to me that a certain percentage of dogs would appropriately self-regulate their own weight and caloric intake ­­- if only we stayed out of it! 4. Her bowl is never full. She's a bottomless pit. She follows us everywhere begging for food. This perfectly describes a chocolate Lab. It also describes a great many of my non-Lab patients (including my own Pug mix, Slumdog). It should be obvious that this dog is not hungry. This dog simply wants to eat. It's been proposed that some dogs who suffer extreme versions of what is sometimes called "food obsession" are experiencing a true behavioral abnormality that may be genetic in origin, but this has not yet been confirmed. A recent study out of the UK describes some of these dogs as Bridget Jones-style "comfort eaters," but that too remains the source of some dispute. In any case, the majority of my overweight patients tend to fall under this latter category. They're the ones who never seem satisfied and tend to be described as chronically "hungry." As such, they don't tend to lose weight easily. Still, if I can somehow convince their owners that they're offering enough calories and that their dogs are not truly hungry in the clinical sense of the word, I can usually make headway when it comes to weight loss. But seeing as it can be hard to know exactly when we, as humans, are truly hungry and when we are not, it's clear this approach has its limitations. Nonetheless, I'm convinced it'll help a certain percentage of pet owners to know that a) food-solicitous behavior doesn't always equate to hunger, b) "hungry" is a universally difficult to interpret concept in the context of our culture, and c) they're not alone.